Josh Gordon banned again. Johnny Manziel in rehab. Kyle Shanahan bolting. Cleveland couldn't be more dysfunctional, and it starts with Jimmy Haslam. The Browns are a mess, and look nowhere but the very top as to why. This offseason is barely a month old, and already we have seen the best coach on the team's staff, Shanahan, allowed to walk away by working out a settlement after just one season there in which he did an outstanding job, bereft of talent, only to become the hottest offensive coordinator candidate in the NFL. The coach's handpicked quarterback, Johnny Manziel, is in rehab after a rookie season marred by late arrivals to work, team security having to be sent to find him at his apartment, late-night incidents with fans, rampant immaturity and complete debacles on the field in practice and his brief appearances in games. 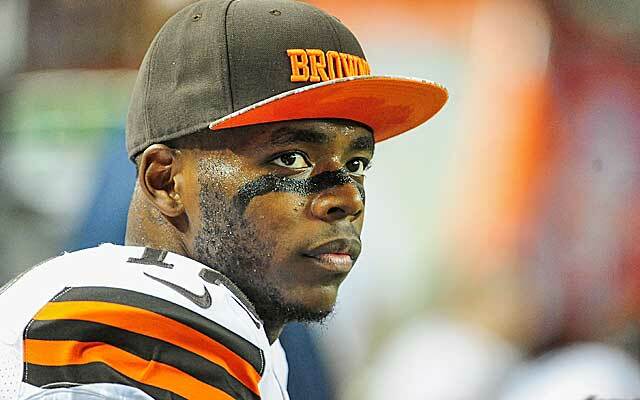 His prized receiver, Josh Gordon, who the quickly-fired duo of Mike Lombardi and Joe Banner had dealt to San Francisco in 2013 for a second-round pick and other compensation before Haslam axed the deal, is suspended, again, for at least another year. This, after his return from suspension in 2014 with uninspired and out-of-shape efforts actually served to torpedo and not boost Cleveland's season. General manager Ray Farmer, looking over his shoulder since he was promoted to that role a year ago and someone who numerous team sources say is a path of least resistance for the owner on personnel matters, is facing an inquiry for illegally contacting coaches during game day. And, sources tell me, that it was not unusual for him to call and/or text former Browns quarterback coach Dowell Loggains in the coaches box during game days and that the NFL's investigation into the matter would certainly reveal as much. (Farmer, who worked under draconian Scott Pioli in Kansas City, seems to have adopted some of his mentor's ways). "Jimmy is way too hands on," said one team source. "He's like Jerry Jones, only without the football knowledge. There's tension between Alec and Pettine. Everybody sees that. Alec is involved in everything; it's too much for him. There are no divisions. The guys on the business side want to run football operations. The GM wants to coach the team and have input on play calling. Jimmy calls the shots, and everyone is afraid of him with that quick trigger finger. If you stand up to Jimmy, he's done with you. Jimmy's own worst enemy is Jimmy." "It's a mess," another team source said. "Everyone is trying to do everyone else's job. It's crazy." Haslam took over the Browns in Oct. 2012, with Banner coming with him. Banner had helped turn the Eagles into a perpetual contender and had vast front office experience. He isn't exactly a people person, and his management style could be gruff, and he was granted sweeping powers by Haslam, but like so many others in Cleveland, wasn't given ample time to dig the team out of his decades-long hole. Haslam made broad changes after the 2012 season -- not unusual at all for a new owner -- firing coach Pat Shurmur and GM Tom Heckert and parting ways with former team president Mike Holmgren (massive front office changes were, frankly, necessary). But new coach Rob Chudzinski lasted just one season -- 2013 -- and after a meandering coaching search to find a replacement, one in which a prominent agent blasted Banner, which sources said left a strong impression with the owner, Haslam began plotting a full makeover. Haslam asked some top front office personnel to create plans for a new structure of the organization, with coaches and front office men reporting to him and not Banner, and then ultimately decided to fire Banner and Lombardi, with Farmer and Scheiner gaining power from within. After having so many candidates express dismay about the head coaching position -- Haslam's reputation as a fast-to-fire owner having something to do with it -- he hired Pettine, who was not in contention for other head coaching jobs. Without proven commodities in positions of power -- instead a first-time coach and GM -- the impediments to calling the shots were few and far between (not that Haslam had been shy to veto certain moves in the past, anyway). A year later, the Browns are in a far worse place. Big draft misses Manziel's rookie season could not have been more disappointing -- to the point where now Haslam is plotting trading up to draft Marcus Mariota this spring, sources said -- and Manziel's presence in Cleveland is born of Haslam, sources said. The owner wanted to make a splash, add some pop to his franchise, sell some tickets and jerseys. "That was a business decision," said one source with direct knowledge of the situation. "That's on the owner." The board in Farmer's office leading up to the draft had three names atop it -- Derek Carr, Teddy Bridgewater and Manziel, in that order, sources said. Cleveland was all in for a quarterback last spring. Banner and Lombardi stocked up on 2014 picks knowing it should be a decent quarterback draft. That included the masterstroke of getting a first-round pick for a first-round bust, Trent Richardson, who they assumed from the prior regime. The organization also spent considerable money on a statistical report assessing all the factors that went into being a successful quarterback. That report suggested drafting Bridgewater. Pettine was largely a non-factor in the quarterback-drafting decision, and after an astute trade with Buffalo -- landing a 2015 first-round pick to move down a few spots -- Cleveland, knowing Gordon's status deep in the substance-abuse program, could have drafted any number of impact receivers but instead took corner Justin Gilbert, whose rookie season was nearly as disastrous as Manziel's (more on him later). With their second pick, it was all about a quarterback, but with Carr and Bridgewater -- the 2014 Offensive Rookie of the Year, still on the board, Manziel was the selection with the 22nd pick. It was no secret within the organization why Manziel was there -- Haslam. Thus, there was already inherent pressure to play him, despite him coming from a rudimentary college system, despite him being distant and awkward with teammates (it was common for him to eat alone and walk the halls with headphones on, sources said). Brian Hoyer, a Cleveland native, held him off as opening day starter -- Hoyer even coming off an ACL injury knew the system much better and quickly earned a trust with Shanahan and Pettine that Manziel has never come close to gaining yet. But the question always loomed for how long. The Browns, despite losing star center Alex Mack for the season and having a paltry cast on offense and struggling much of the season to stop the run, somehow led the powerful AFC North much of the season. Hoyer, after barely turning the ball over in the first half of the season, began throwing picks -- the run game dried up and his options were few -- and Gordon's return from a 10-game suspension actually slowed the team down. Gordon continued his trend as an unmotivated figure around the team, late for meetings with regularity, looking lethargic in practice. He was not in game-shape, sources said, but was known to be a Haslam favorite. During his breakout 2013 season – thriving on Sundays despite being a constant headache to the staff and needing constant baby-sitting and being on the verge of another year-long suspension – Lombardi and Banner had an offer of a second-round pick, at least, from San Francisco for Gordon before the October trade deadline. He was a constant risk off field, a bad influence to younger players (something echoed loudly, in private, by Browns coaches this season). Haslam vetoed the trade. This season, Gordon failed to get to passes he normally would, dropped balls, ran the wrong routes, was late to meetings and walkthroughs, and made some blunders at Atlanta in Week 12 that contributed to Hoyer's three interceptions. Still, Hoyer led a game-winning drive in the waning moments, making the Browns a shocking 7-4. In the locker room afterward, teammates flocked to Hoyer -- who orchestrated several wild comebacks that season -- and Pettine embraced him, but Haslam and Scheiner were aloof, standing in the corner, sources said, not involved in the celebration. Pettine admitted after the game he would have to mull over his quarterback decision -- after meeting with Shanahan, other coaches, and top players, sources said the decision was unanimous that Hoyer must remain the starter (Manziel wasn't close to ready). But the die was cast. 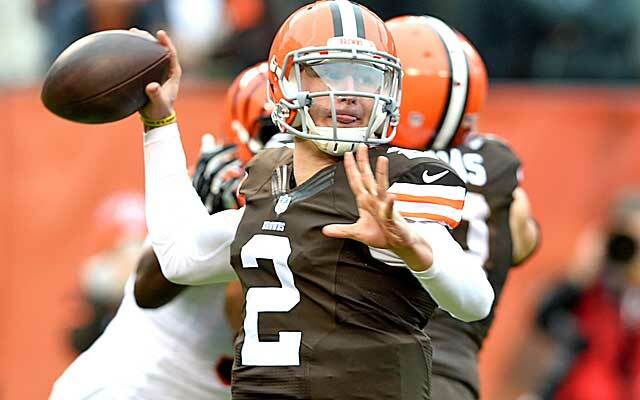 Soon enough, Manziel would play. It was clear where the owner stood and the public outcry was growing; Haslam's draft pick had sold a ton of jerseys and t-shirts, and those fans wanted to see him play soon enough. 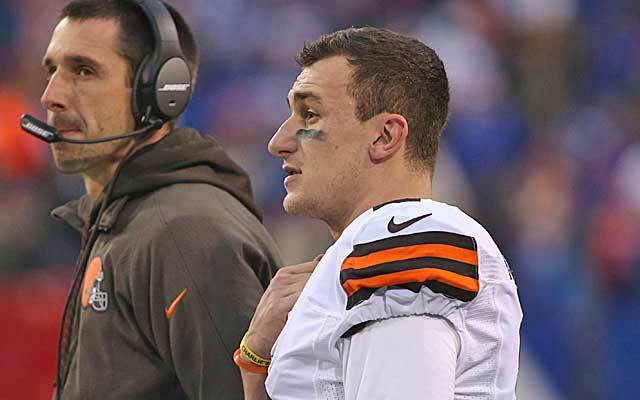 The Browns lost to the Bills the following week, with Manziel coming on late in a blowout, and after a one-point loss to the Colts (who would play in the AFC Championship game), Manziel got his first start in Week 15, a brutal, 30-0 loss to the Bengals that effectively ended the season. Manziel didn't look close to being ready -- sources said he barely completed 40 percent of his passes in practice all week, leading to panic in the front office -- and Manziel had to be fined in Week 17, when, injured, he couldn't make it to work in time for treatment, with security having to be sent to his house to try to rouse him. Gilbert's rookie season followed a similar arc. He was routinely late, was a chronic knucklehead and rubbed teammates and coaches the wrong way, sources said. At times the coaches had to have him active on game days due to not having enough healthy corners, but his shortage of playing time was accountable not so much to injuries or poor practice as to his habits. Players must be to the stadium by 11 am at the latest on game days for 1 p.m. kickoffs, but Gilbert showed up as late as 11:45 at least once. By the end of the season he was seen more as a nuisance than an asset. At season's end Shanahan, the lone bright spot on offense, perhaps, presented Pettine with a 32-point presentation on why he wanted to get out of his contract, sources said. And after much deliberation among lawyers and negotiation, in a bizarre precedent, a statement was crafted and Shanahan was a free man. He would end up in Atlanta, a coveted job, and a hiring that Banner, consulting for Falcons owner Arthur Blank, played a role in; Lombardi just won a Super Bowl ring as a personnel advisor to Bill Belichick. Allowing Shanahan to walk sent shockwaves through the building, with such a talented coach allowed to go at a time when the Browns desperately needed to develop a quarterback and with a quarter of the teams in the NFL needing a new offensive coordinator. The Browns made no move to secure Hoyer, a pending free agent, all season, and with Manziel in rehab, have only Connor Shaw on the roster right now. And the staff put together in Shanahan's absence -- offensive coordinator John DeFilippo, a close friend of Pettine's who was gone as Oakland's quarterbacks coach, and first-time quarterbacks coach Kevin O'Connell -- hasn't exactly stirred enthusiasm either. Consider: In two years the Browns have gone from Norv Turner to Kyle Shanahan to DeFilippo running their offense. O'Connell worked with Manziel during his pre-draft prep but has never coached in the NFL, and he was beaten out by Hoyer, now a free agent, just a few years ago as the back-up to Tom Brady in New England -- a potentially awkward situation that won't increase the odds Hoyer returns there. Jordan Cameron, a talented-but-injury-prone tight end who is also a free agent, is not interested in returning to Cleveland either, sources said. The free agent quarterback market is beyond limited, and some NFL executives believe Mark Sanchez, hardly a savior, is the best of the bunch. But Pettine is not interested in a reunion with Sanchez after working with him in New York, and he is not in the team's free-agent plans, sources said. Maybe they go crazy to trade up for Mariota. Maybe it doesn't really matter at this point. The staff and the front office are not inspiring great hope for the future and the overriding sentiment in that building, from the people I speak to, is that Haslam will be making sweeping changes again by the end of the 2015 season. And you have to wonder at this point when that trend will change. A year ago, Haslam could have been sitting on two-first round picks, two second-round picks (had he allowed the Gordon trade), and two third-round picks, plus $55M in cap space, and a front office that was very high on Bridgewater and Odell Beckham, Jr., and had already ridden the team of previous draft failures like Richardson and Brandon Weeden. It wasn't nearly enough to merit a second season on the job. You have to wonder, under Haslam, as long as he is this involved, if anything ever will. You have to wonder if this week -- with Manziel in rehab and Gordon banished from the league for 2015 -- is rock bottom for the Browns. You have to wonder if things will ever change.